You’ll find The Angel (pictured top and below) in the historic market square of Bury St Edmunds, making it the perfect base for exploring this charming town. 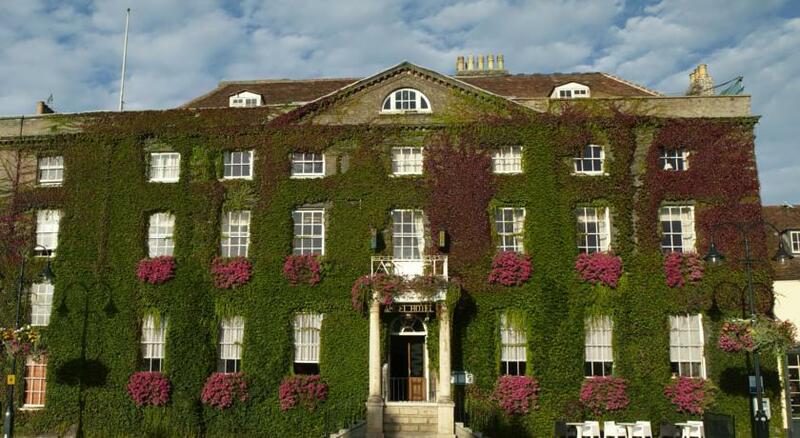 The beautiful building is hard to miss, thanks to its exteriors covered in ivy and pink flowers. The property is even mentioned in Charles Dickens’ Pickwick Papers but its four star accommodation is most worthy of the 21st century. The 78 rooms are all individually decorated, using zesty, contemporary colours in contrast to the historic setting. Comfort is high on the agenda here, and there are some lovely indulgent details such as ornate French beds and freestanding copper baths. 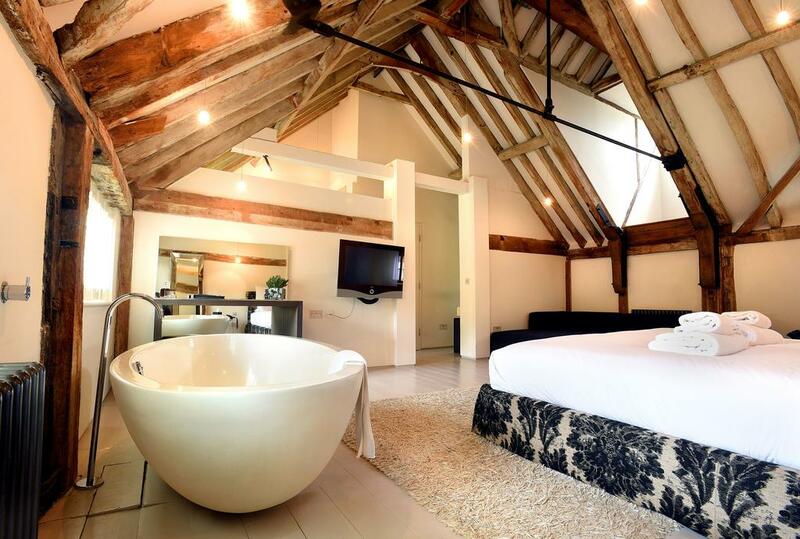 Tuddenham Mill (*****) provides an opportunity to stay in a converted 17th-century watermill in an idyllic setting, complete with its own award-winning restaurant. The building has been lovingly renovated, and balances its historic charm with a cool, calm contemporary style along with plenty of comforts. Each room has over-sized beds, Bose sound systems and Loewe flat screen TVs, for starters. But, for pure indulgence, check into one of the beamed Loft rooms, with their double-ended free-standing stone baths, amazing views across the water meadows and some great touches, such as your very own telescope. Tuddenham Mill is well located, situated between Newmarket, Bury St Edmunds and Cambridge, and there’s opportunity for rural explorations too, being close to Brecklands and Thetford Forest. If that sounds something that would please your canine companion, you’ll be happy to hear that they also have dog-friendly rooms. The Crown offers boutique accommodation in the centre of the market town of Woodbridge, in a building dating back to the 16th century. 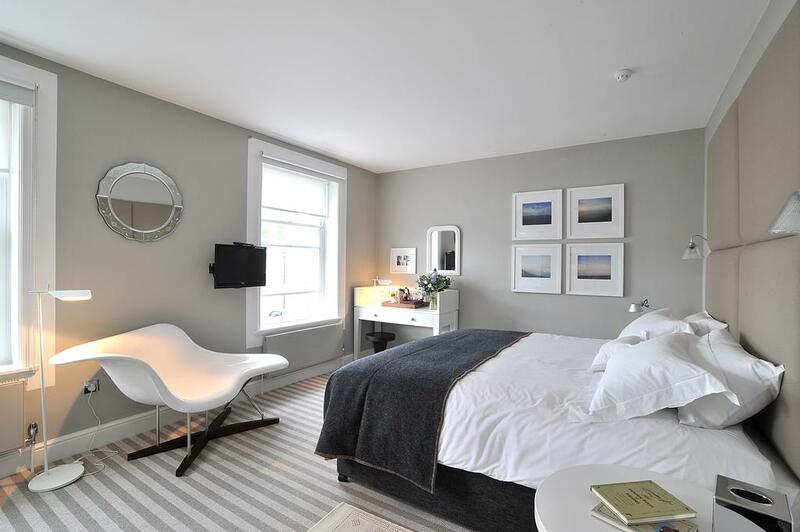 Each of the ten bedrooms has been given their own individual look by interior designers Bentheim with their cool whites and greys taking their inspiration from New England coastal style. 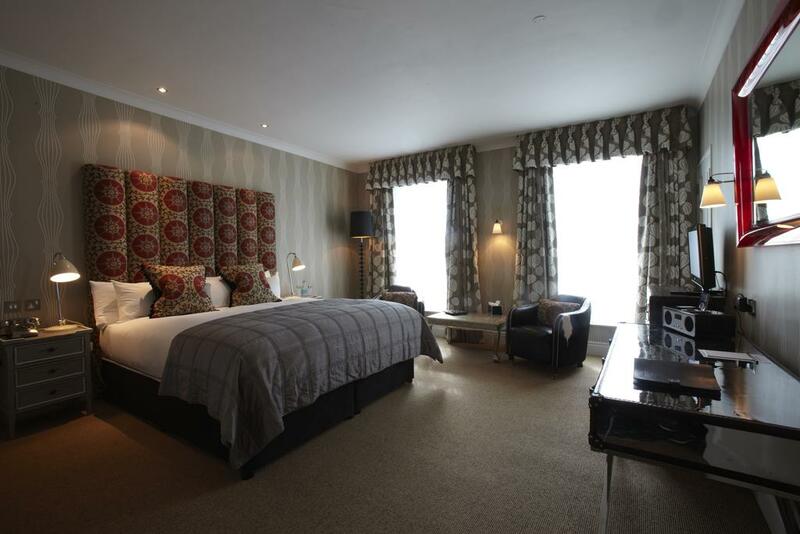 Luxurious details include underfloor heating, crisp linen on Hypnos beds and REN toiletries. If that’s not to instantly make you switch off and relax, simply head for their Bathsheba spa, enjoy a pint or two at their bustling bar, or book yourself into the award winning restaurant serving up some of Suffolk’s finest produce. To experience the Suffolk seaside from a base that’s full of character, book yourself into Sutherland House (*****) in the seaside resort of Southwold. 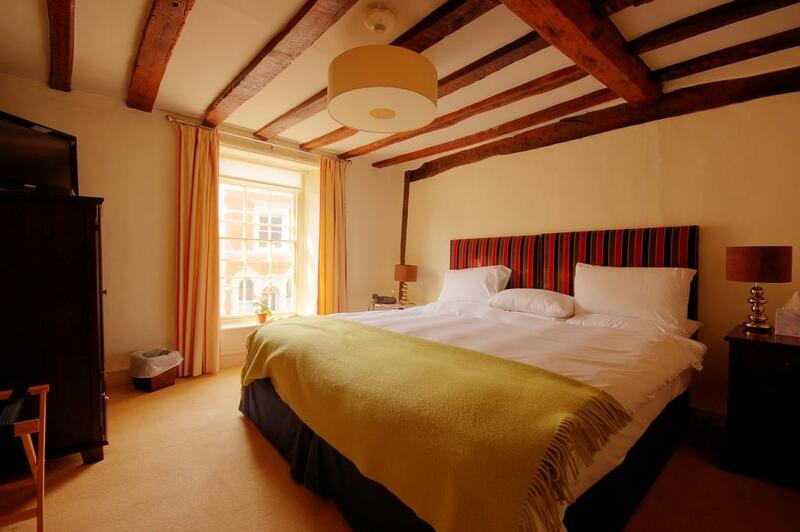 Even by Suffolk standards, this accommodation is really historic – it’s a Grade II listed building, dating back to 1455. While there are just four bedrooms to pick from, each has their unique selling points – be that a sleigh bed under a pargetted ceiling from 1660, or a double-ended slipper bath place in front of an open fireplace. Another enticing reason to staying here is the fish restaurant, which prides itself on its imaginative use of locally sourced ingredients – so locally sourced, in fact, that they print their food miles on the menu. 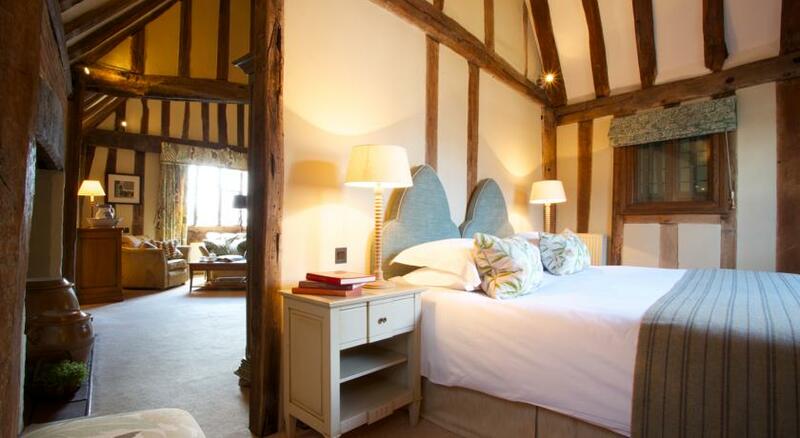 The Swan at Lavenham (****) offers four-star luxury in another stunning building. It’s a place filled with cosy nooks and crannies, each room with its own story to tell, from the minstrel’s gallery in the vaulted dining room to the wartime airmen’s bar. There’s even rumours of a resident ghost! Whether you believe that or not, the beauty of The Swan’s original beams and leaded windows is undeniable. Their 45 rooms are varied in style – whether enhancing the heritage feel, or emphasising contemporary style, they offer timeless comfort. The modern spa, meanwhile, contains six treatment rooms, a sauna and a steam room. Should you ever wish to leave the hotel, you’ll have fun discovering the delights of Lavenham, which is one of Britain’s most beautifully preserved medieval villages.